Volamena Spot Lightening Cream is a revolutionary product containing optimal concentration of Hydroxycinnamic Acid which is proven to be effective on blemishes, age spots, and hyperpigmentation of the skin. This advanced formulation reduces the appearance of dark spots, age spots, skin discolorations and surface blemishes. 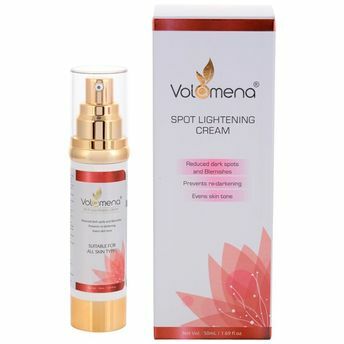 It also minimizes the visible effects of sun damage, age, skin stresses and post-acne scarring, thereby improving the firmness and tone of the skin. The non-sticky and ultra-light texture have been scientifically developed. It absorbs quickly and leaves no residue. This moisture-filled cream takes care of your skin tone, dark spots and skin texture for transparency and brightness. This product contains niacin amide, which contains vitamin B and has the ability to retain moisture and is anti-inflammatory.